China is on the path of national revival, the so-called Chinese Dream. As part of the Chinese Dream, the Chinese envision a new version of the famous Silk Roads, the caravan routes that linked Asia with the West. For centuries, camel caravans carried Chinese silk, tea and spices to the west. From the west, precious metals and gems, art and music, and new philosophies and religions - including Buddhism and Islam - came to China. Chinese ships reached the Persian Gulf in the Middle East and East Africa. Today, the Chinese are reviving ancient trade routes and building new ones, seeking once again to link east and west by both land and sea routes. 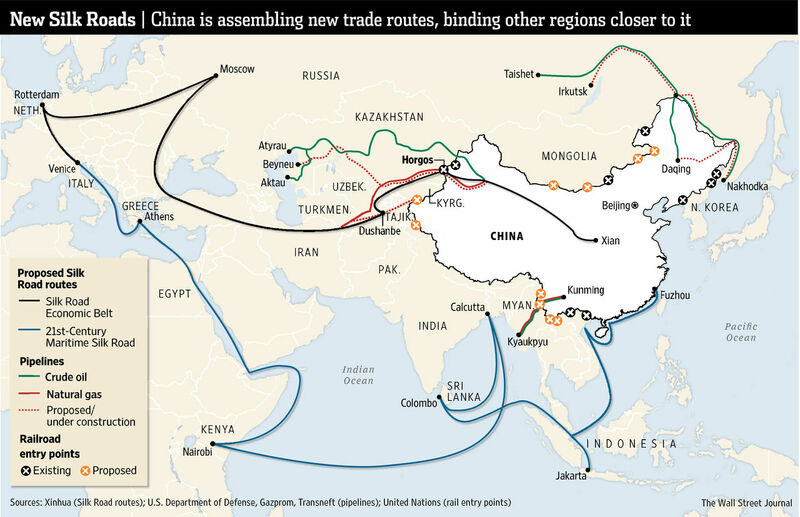 Chinese call the New Silk Roads yi lou, yi dai, which translates as "one road, one belt." The twenty-first century Silk Roads will travel from China through Central Asia, the Caucasus, and Russia to arrive in Europe. 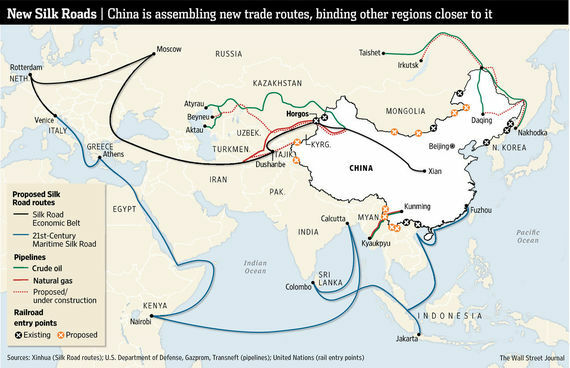 In addition to land routes, China is seeking to establish extensive maritime routes. The Twenty-First Century Maritime Silk Road runs from ports in China through Southeast Asia, South Asia, East Africa and the Middle East to European ports. The new land- and maritime-Silk Roads will both terminate at Rotterdam, The Netherlands. These New Silk Roads projects, if successfully completed, will transform the economic and political maps of the super Eurasian-African continent through an integrated and improved infrastructure. China is sponsoring and financing the construction of new railway lines and bridges, as well as the refurbishing and expansion of airports and shipping ports, power plants and pipelines. Much of this will be accomplished through the new banking initiative, Asian Infrastructure Investment Bank (AIIB). AIIB has fifty-seven founding members hailing from six continents. Hopefully, like the ancient Silk Roads, these new Silk Roads will facilitate more than an exchange of goods. Cultural, scholarly, artistic and philosophical ideas will also emerge as part of the cargo carried by these modern day caravans. The term American Dream wasn't coined by the Founding Fathers. Specifically, it wasn't written by Thomas Jefferson who wrote of "Life, Liberty and the Pursuit of Happiness" in the Declaration of Independence. The term originated in a book by author James Truslow Adams called The Epic of America. Adams' book was published by Little, Brown and Company in 1931. At that time, America was in the dark throes of the Great Depression. A shot at the American Dream was too far beyond the next hot meal to even be a dream for millions of Americans. Like many Americans, hearing the words "American Dream" brings me a vision of Norman Rockwell's Four Freedoms paintings of wartime America. The series was inspired by a 1941 speech given by Franklin D. Roosevelt. Roosevelt described four principles necessary for universal rights: Freedom of Speech, Freedom of Worship,Freedom from Want and Freedom from Fear. 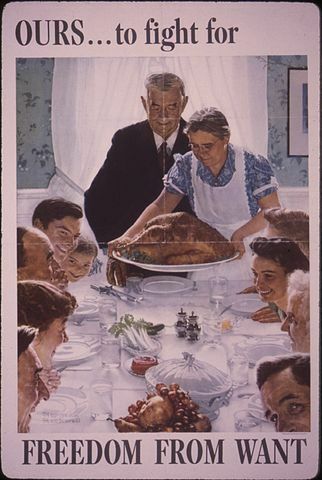 Rockwell's Four Freedoms paintings were published in The Saturday Evening Post. Freedom from Want was and remains the most beloved painting in the series. I had never heard of author James Truslow Adams and his 1931 book. But Adams hits it right on the American head when he describes it as a dream for all Americans. The American Dream has been our birthright, beginning with the Pilgrims on Plymouth Rock and extending through hard times, like the Great Depression and the Great Recession of the 21st century. In his 2009 inauguration speech, Mr. Obama spoke of "the American Dream in reverse." I would argue instead that Barack Obama himself achieved the American Dream when he was elected President of the United States. Certainly, he knew this when he said, "Only in America is my story possible." The American Dream is alive and well, Mr. Obama. Today, the American Dream and its component of personal liberties and economic opportunities, remains, I maintain, unmatched in scale by any other country in the history of the world. Historically, the frontier of the American West was the place to pursue the American Dream. It was a place of dreams for dreamers who created a land of security and bounty with their own two hands. Today, there are new frontiers to pursue the American Dream. Instead of looking to the American West, we should look westward across the Pacific Ocean, towards China. By linking the American Dream with the Chinese Dream, we can link the world's number one and number two economies. We can create a new, unprecedented prosperity that will reach across the globe. In addition to the Silk Roads projects, China is also proposing to link economies on both sides of the Pacific Ocean through the Free Trade Area of the Asia-Pacific (FTAAP). It is very likely that, in the end, the FTAAP and the U.S.-led Trans-Pacific Partnership (TPP) will converge. This would result in increased trade between America and China. Such an increase, from east to west and from west to east, would benefit both China and the United States in an increasingly strong partnership between our two countries. From an historical perspective, the revival of China is inevitable. China has been the dominant economic power in the world for much of history. It is currently one of the fastest-growing economies in the world. Working in partnership with China is the best way to realize new dreams on both sides of the Pacific. Chinese know that the Chinese Dream can only be realized in a peaceful and stable international environment. The Chinese Dream can best be accomplished by working in partnership with the United States, the world's indisputable superpower. Now, it's up to Americans to join with the Chinese in a genuine partnership to rewrite the governing principles and rules for a new international regime. Instead of undermining Chinese efforts and attempting to contain the rise of China, the United States should play the role of China's partner instead of its adversary. The United States has chosen not to join AIIB as a founding member, thus missing the chance to contribute to its governance and structure. Instead, the United States is pushing for a Trans-Pacific Partnership that excludes China. As new infrastructure projects rise across the map, the infrastructure of the United States is aging. 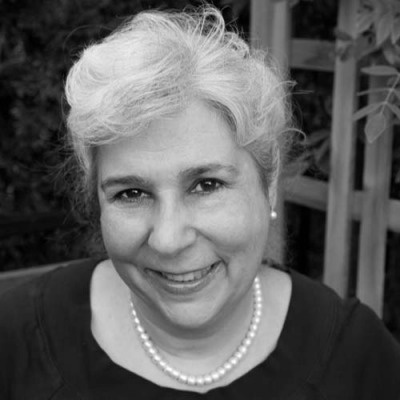 As the sole military superpower, it is both tempting and dangerous for the United States to turn to the threat and use of military power, instead of diplomacy, to solve international disputes. In the United States, we still have the basic components for the American Dream in our system of government and our capitalist economic philosophy. But we now have to work hand-in-hand with those on the other side of the globe. We will need to learn to work with those who think differently, act differently and have a different view of our American way of life. I believe we are up to the challenge. The Chinese Dream and the American Dream are complementary. Both are attainable. Together, the Chinese Dream and the American Dream have the potential to create a new World Dream with unprecedented peace and prosperity for historically undreamed of numbers around the globe.